Hotspots are invisible buttons. They're great for triggering actions, like showing layers and jumping to other slides. They're also very effective in drag-and-drop interactions. 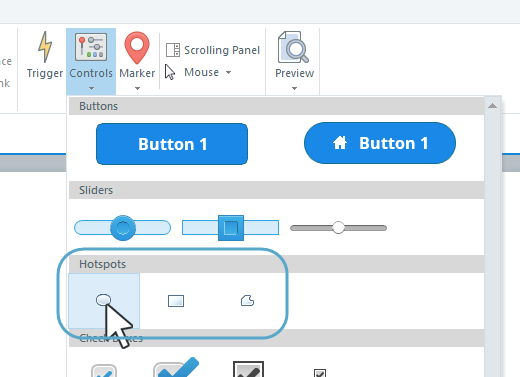 Go to the Insert tab on the ribbon, click Interactive Controls, and choose one of the hotspot shapes (Oval, Rectangle, or Freeform). Draw the hotspot on your slide. 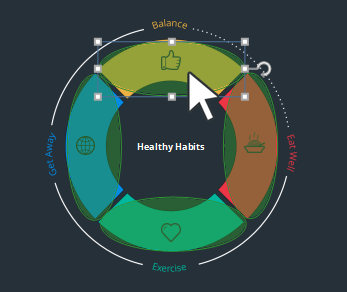 While you're working in Articulate Storyline, hotspots will appear as semi-transparent shapes, but they're completely invisible when you preview or publish. To resize a hotspot, drag any of its sizing handles. To rotate a hotspot, drag its rotation handle. To reposition a hotspot, just drag it to another location on the slide. Tip: Another way to resize, rotate, and reposition a hotspot is to right-click it and select Size and Position. See this tutorial for details. By default, your mouse will change to a hand cursor when you hover over a hotspot in a published course. 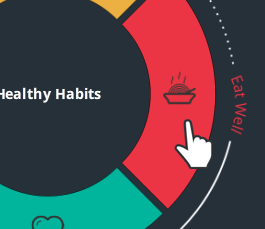 This is great if you want learners to know that part of the screen is clickable. 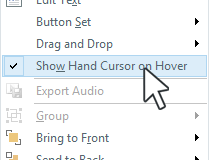 If you don’t want the mouse to change to a hand cursor, right-click the hotspot and uncheck the option to Show Hand Cursor on Hover. To make hotspots interactive, you'll need to add triggers to them. Every hotspot has one trigger by default, but it's "unassigned." To modify it, double-click it to open it for editing. To learn more about triggers, see this tutorial. Tip: You can add multiple triggers to the same hotspot. 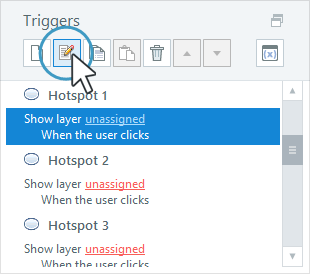 For example, you might add a trigger to show a layer when learners hover over a hotspot, and you might add another trigger to jump to a different slide when they click it. Storyline gives each hotspot a default name, such as "Hotspot 1." We recommend giving them more intuitive names, so they're recognizable when adding triggers and creating freeform interactions. One way to rename a hotspot is to right-click it and select Rename. Another way is to double-click the hotspot in the timeline. To delete a hotspot, select it on the slide or in the timeline, then click Delete on your keyboard. You can arrange hotspots with other objects on a slide by sending them backward or bringing them forward. However, their triggers won't work if they're covered by other items on the slide. You can format hotspots with colors and effects to make them easier to see while you're working in Storyline. They'll still be invisible in your published course.